A license plate recognition (LPR) software company has introduced one such system innovation which aids officers in vehicle and criminal identification. This License Plate Recognition software uses advanced optical character recognition to read any plate that passes in front of an integrated video camera, and instantly compares that information to crime databases for active warrants or other alerts. If the software receives a positive hit, it alerts the officer, adds vehicle information to an internal database and instructs the camera to store the video. The officer then has identification information for the vehicle and is able to take immediate action. In the past, License Plate Recognition systems have required more space, cost, time and equipment than a software-only solution. This specific software operates efficiently with any Windows PC system and IP camera(s), as long as the camera records a quality image. A particular customer’s License Plate Recognition system contained specific high-power IP cameras installed in its police cars, posing a problem and potential risk. The cars provided a significantly low initial voltage input (12VDC), which likely meant extra equipment was necessary. 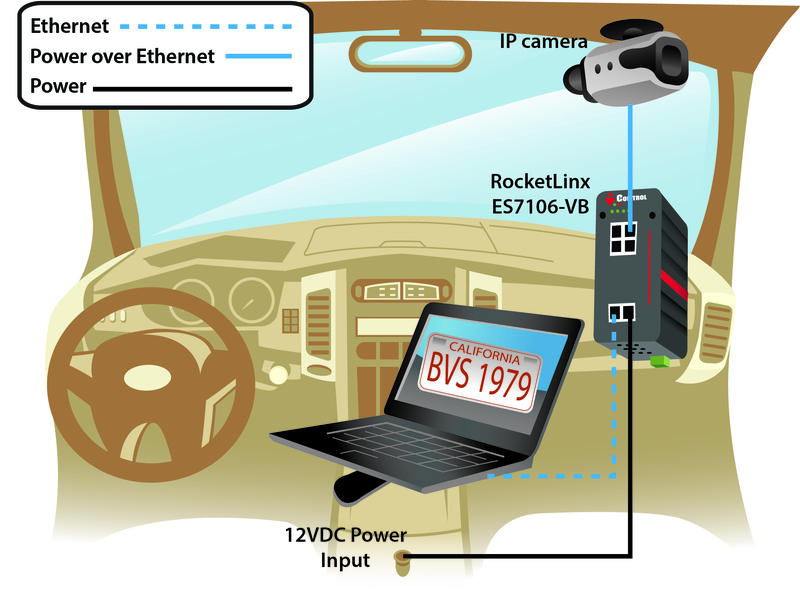 The License Plate Recognition software company then discovered Comtrol’s RocketLinx® ES7106-VB (voltage boost) PoE (Power over Ethernet) switch, which used the 12VDC input power from the police cars’ cigarette lighter receptacles and converted or “boosted” output power to 48VDC – sufficient voltage to power the cameras. Installing the switch eliminated risk of potential power inverter overheating problems, and the configuration needed no extra cabling, power supply or conversion/inversion of power between the source and the switch. The company had previously found these extra components necessary when recommending select hardware to customers. Comtrol’s RocketLinx ES7106-VB switch was chosen not only for simplification, but for its durability, rugged housing and reputable name. It is equipped with four 10/100BASE-TX PoE injector ports, with each port delivering power up to 15.4W, and two 10/100/1000BASE-TX (Gigabit) Ethernet uplink ports for transferring ddata to the network. The switch also supports QoS, which ensures high-quality video traffic transmission by adjusting the data transfer priority. The RocketLinx ES7106-VB is an IEEE 802.3af compliant PoE switch designed for connecting a wide range of industrial PoE equipment such as IP surveillance cameras, wireless access points and other devices utilizing 12/24V vehicle power sources or 24V standard industrial power. Comtrol Corporation, a leading manufacturer of industrial device communication products, today announced the release of the RocketLinx ES7106-VB industrial Power over Ethernet (PoE) switch. 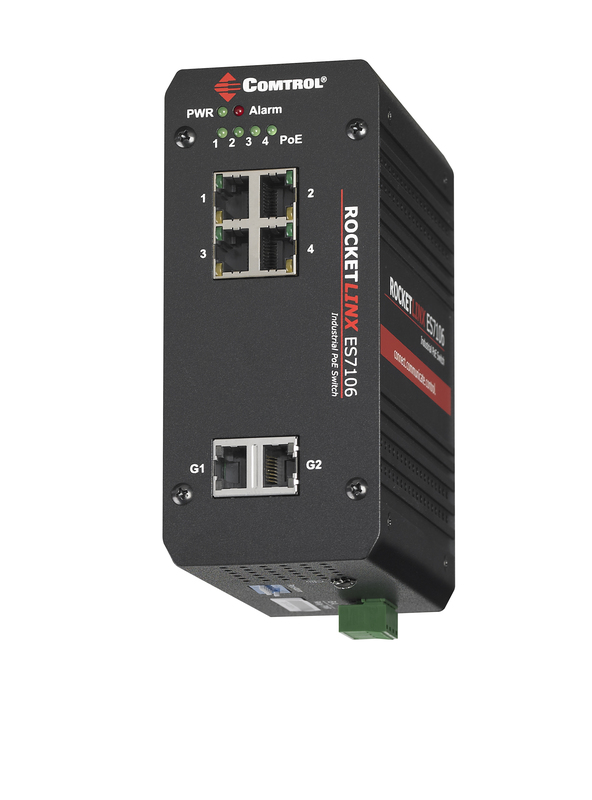 The RocketLinx ES7106-VB switch enables easy drop-in PoE device connectivity in transportation, factory and industrial settings while the VB (voltage boost) technology provides the unique capability to power the switch from common 12- and 24-volt supplies. 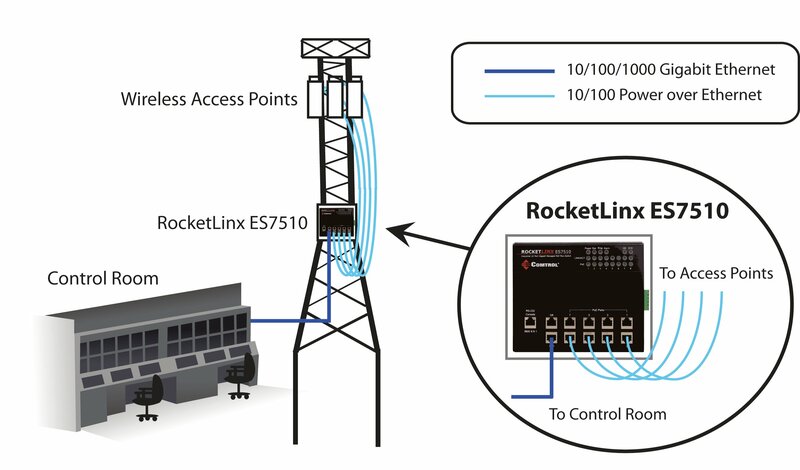 With the RocketLinx ES7106-VB, devices such as IP surveillance cameras, scanners and wireless access points can be easily integrated within mobile and industrial settings without the use of separate 48V power supplies that may be needed for PoE systems. Four PoE injector switch ports provide full IEEE 802.3af support, enabling connection of a wide range of PoE devices. Two Gigabit Ethernet uplink ports provide high bandwidth for data transmission to a larger network. With a rugged heat-dissipating housing and IP30-rated industrial design, the ES7106-VB assures reliable data transmission with support for QoS (quality of service), which ensures high quality video traffic transmission by adjusting the data transfer priority ot guarantee throughput performance. Additionally, each Ethernet port has a Port Link Alarm that can be configured to automatically trigger a relay on connection issues to warn of abnormal operating conditions and ensure quick resolution to network issues. 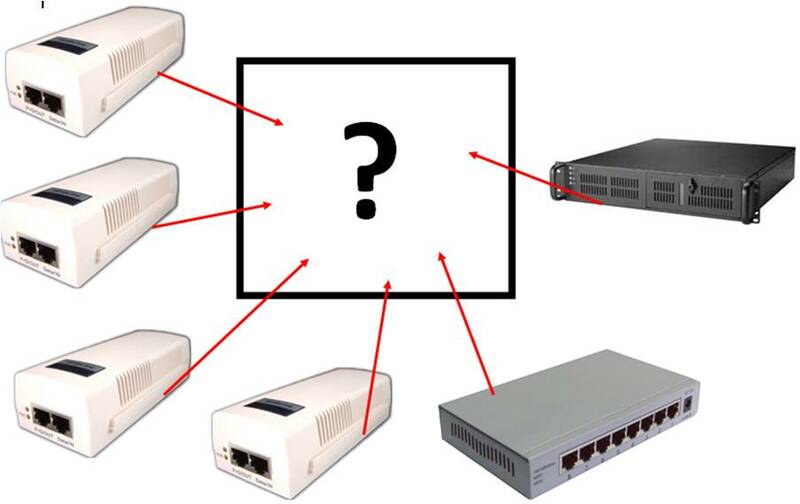 What are you missing in your Power over Ethernet (PoE) solution? As deployment of Power over Ethernet devices increases, so do the features and functionality options that we have to offer with our RocketLinx PoE product line. With rugged, drip-proof housings, redundant power inputs, alarm relay, and advanced PD (Powered Device) management and control capabilities, our Power over Ethernet switches provide networking functionality well beyond typical IT-grade PoE solutions. Comtrol’s voltage boost switch technology enables these switch models to be powered from 12/24 VDC sources, internally boosting the output voltage to 48 VDC to power PoE devices. This eliminates the need and expense of a separate power supply and allows direct integration with remote and vehicle power systems. RocketLinx PoE switches provide advanced forced powering control, bringing power to non-standard and older PoE devices that cannot be detected as valid PDs. Comtrol’s PoE port scheduling feature provides an hourly/weekly scheduling mechanism for advanced power control. Each PoE port can be configured to be ON or OFF on an hourly basis to conserve energy and guarantee power only when needed. Monitor the status of PDs connected to RocketLinx PoE switches through RocketLinx PD management technology. When a PD fails to respond, the PoE port can cycle power, thereby resetting the PD and restoring functionality. When conditions demand power exceeding the power budget threshold, the RocketLinx PoE switches provide budget and priority control ensuring that the total power consumption will not exceed the power limit defined by the user. It also allows the user to protect the high-priority PDs by limiting the output power, prioritizing port shut down, and maintaining power to the highest priority devices. As the demand for high-speed internet continues to grow, numerous regional Wireless Internet Service Providers (WISPs) have stepped in to fill the need. By mounting wireless access points on remote towers, business and residential customers are able to conveniently access wireless internet at speeds much faster than traditional T1 connections. 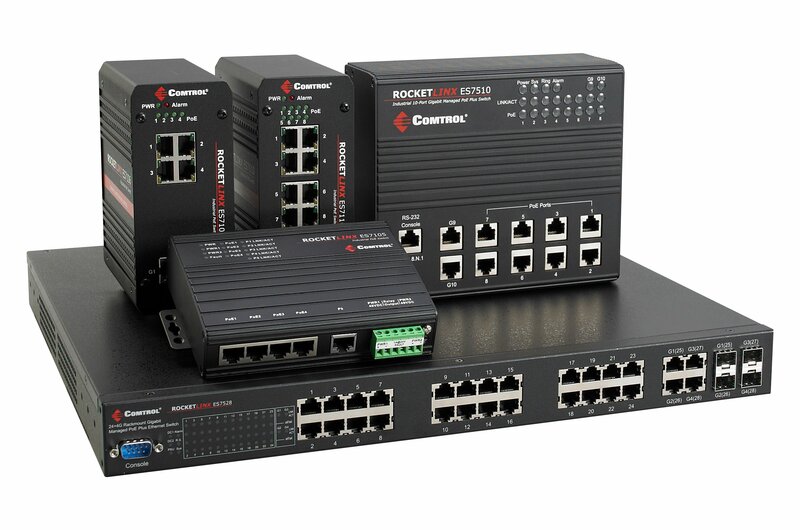 Comtrol Corporation’s line of RocketLinx ES75XX managed Power over Ethernet switches provide both power and a managed network link from each access point to the main network through a single connection. With a wide operating temperature and IP31 environmental protection from solid objects (>2.5mm) and vertical water flow, the ES75XX series is capable of withstanding conditions commonly found on wireless towers. Comtrol’s Ethernet management package provides up to 296 simultaneous VLAN’s and IGMP Snooping/Query for multicast traffic management, two features imperative for efficient bandwidth management. Additionally, Comtrol’s support of the IEEE 802.3af, IEEE 802.3at and non-standard +24VDC PoE output allows a wide range of access points to be powered quickly and easily.